We should have a new sign,' said Lizard. 'Exactly what I was thinking!' cried Snake. 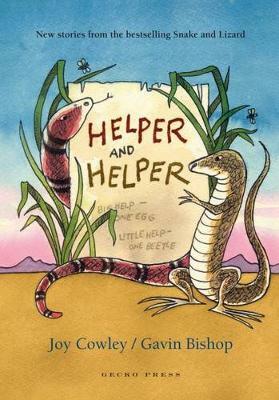 'A huge sign at the entrance of our burrow!Snake and Lizard, Helper and Helper.Big help one egg. Little help one beetle. 'Lizard said in a small squeak, 'Lizard and Snake. What? 'He lifted his chin in defiance. 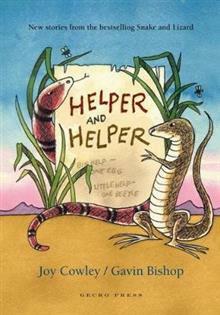 'Lizard and Snake!Lizard and Snake! My dear friend, we can't have that. Creaturesare used to Snake and Lizard. They'll thinkLizard and Snake is a new partnership. Joy Cowley is one of New Zealand's best-loved writers for children and adults, with an international reputation. She has won a multitude of awards and honours for her best-selling books.Gavin Bishop is equally distinguished as author and illustrator. He has exhibited internationally, from Japan to Czechoslovakia, and was an international judge for the 2003 NOMA Concours competition for Children's Picture Book Illustration.